Updated Thursday February 8, 2018 by FCLL. Long the pacesetter in youth sports safety, Little League has again taken the lead with the development of ASAP (A Safety Awareness Program). With the help of corporate sponsors Musco Lighting and Chartis Insurance Companies, ASAP has created a network of more than 5600 safety officers working together for safety. ASAP is a grass roots program based on communication of ideas. 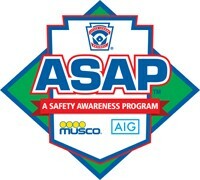 Four County Little League and Leagues across the country contribute their safety ideas to ASAP News, a colorful, monthly newsletter. Safety officers can then find out what their peers are doing to make things "safer for the kids." On the safety page we have all things safety. We have all the forms needed in addition to the full updated safety manual. Also you will find some safety articles that may be of interest to you. Visit often. If you have any questions email safety@fcllbaseball.org.